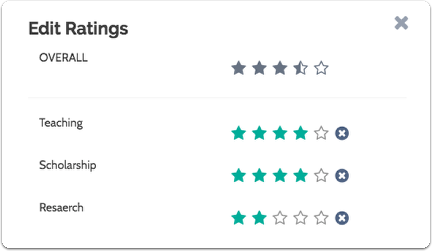 If your institution or department allows it, Evaluators can rate applicants on a simple 5-star scale. 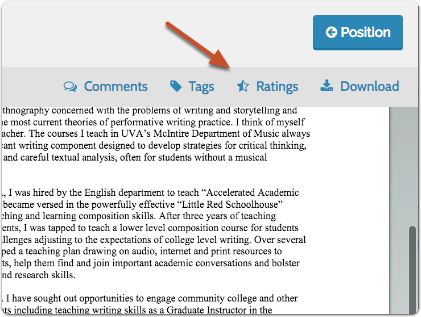 Ratings can be assigned and viewed from the Applicant Profile page or from within the Materials Viewer. 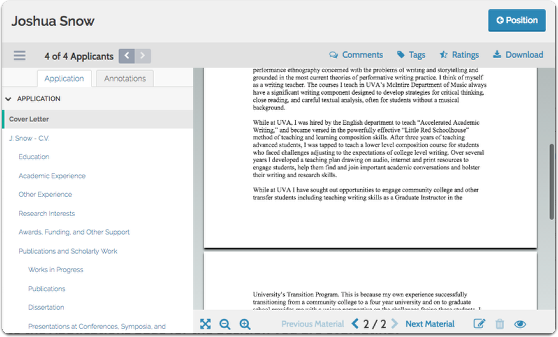 Depending on the settings established by your institution, you may or may not be able to see the ratings of other Evaluators. 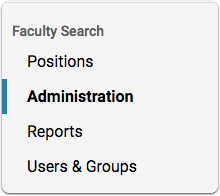 Click the Positions page from the navigation bar. If enabled, you will see an average of the ratings you have given the applicant to the right of the page. If the search has been set up as blind review, you will only see your own ratings. If allowed, you may see a summary of the ratings of other Evaluators on your committee. Click "Applicant Name" at the top of the table to load all applications into the viewer.